Global Dispatch is an intelligent, agent-based service-level global server load balancing solution that provides high availability and optimum performance for geographically distributed business applications. Global Dispatch eases management of globally distributed traffic to ensure it is always directed to the most available, responsive sites, while its powerful management tools gather critical site metrics that help in the decision making process. 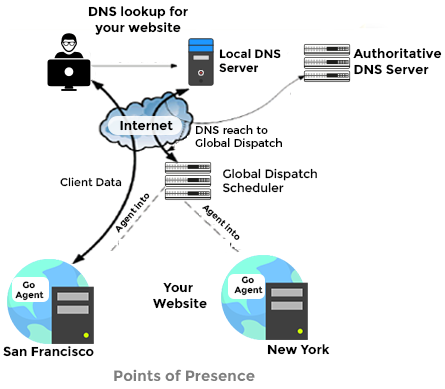 A native software solution that layers onto existing infrastructure, including existing DNS and local server load balancing solutions, Global Dispatch enables companies to quickly and easily deploy a redundant site, and ultimately deliver a global traffic management solution that delivers a great end-user experience. Global Dispatch enhances the user experience by employing it’s global server load balancing routines to route each user to the data center with the content most relevant to their needs. For example, users can be directed to the data center closest to their location to minimize WAN costs. Across the global corporate network or over the Internet, employees, customers and partners expect fast, reliable service for a host of business-critical applications – Global Dispatch delivers just that. Global Dispatch facilitates deployment of redundant sites because its intuitive, easy-to-use GUI makes it quick to configure new sites. User requests are directed to, and maintained at one site, until data is synchronized across other sites. This greatly simplifies content and database replication across multiple data centers. impact operations or application availability. proxy to the authoritative DNS server. Allow the administrator to switch between load balancing and fail-over operation at the click of a button. Administrators can easily set up, configure and manage multiple geographically distributed sites through an intuitive graphical console. Agent-based software deploys easily into any network, whether sites are load balanced with Central Dispatch or 3rd party load balancers. Routing traffic to the site with the most capacity helps administrators balance the trade-offs between efficiency, cost and quality. A simple and intuitive user interface taps into the industry’s deepest set of statistics collected from the sites.